For the love of the hobby! Hobbies are expensive, and the RC hobby is no exception. And thus, a place like this, where RC-loving people gather, will also attract people with different motivations, like those trying to gain something for nothing. Sometimes it seems like their activities start to overshadow the real spirit of RC. When subforums are being overrun by people spamming "deal-topics", sometimes even creating extra accounts on RC Groups, to maximize their chances on financial gain. But that's not what RC is about, and it never will be. Imho RC is about a kid saving money with chores, being a paper-boy (or girl), so he or she can buy that kit, or that motor, or something else that is needed to complete the car, boat, plane, or whatever they are trying to get working. Or that sparkle you see in the same kid's eye when running his/her new(ly completed) model. Or as I've personally had the honor to teach a befriended collegue to fly FPV quads, and make such progress that at some point he's no longer a student, but someone having the time of his life, as he mastered the controls enough to be flying solo. That, imho, is the true spirit of RC. Sometimes we may forget this spirit, and don't take time to sit back, and realize what a privilige it is to have access to all this exciting technology that enables us to enjoy this hobby in ways that weren't possible years ago. It's not about gathering free samples, clicks, how many subscribers, who's the best driver, pilot, etc, or affiliate links,and more of that. It's about the joy and excitement this hobby can provide, and being able to spread, and share this feeling with "kindred spirits" who know the value of keeping this in mind. And in case one of us threatens to forget about this, others will hopefully step in to remind this person about what really matters. Maybe this blog entry can help a little with that. RC should be fun, after all, it's a hobby. Hobbies are for relaxing, even when this often means practice, or lots of effort to get where you want to be. With some exceptions, there is often no one-and-only-path, to get there. So what puzzles me, is why some members repeatedly try to enforce their way of thinking upon others. Pushing people that, in their mind are "less educated in RC", down to the ground, on a regular basis. Regularly boasting about their knowledge, and even comparing themselves to celebreties that are considered a genius on their main area of expertise. Problem is that some of these "know-it-alls" are smart enough to mostly stay on the safe side of site rules, and despite being downtrodding towards other members, can avoid getting banned. Some do get banned, and simply register a new account, then quickly return to their old habits, and the only thing that has changed is the username that is wrecking the overall vibe on a subforum. Now there is nothing wrong with being aware of talents and abiliities, or knowlegde and experience gathered over the years. But be thankfull of what you know, or can do, and remember where you came from, no one was born an expert. As a while back there were some problems with Image Shack, and another hosting site I used for my pictures, Majhost.com, I needed to host the most important pictures elsewhere. This thread will serve as alternate hosting place. As the title suggests, the pictures for the build log of a couple of vintage Schumacher CAT cars will be hosted here. Pictures for Build Log - "Project RC10 (x2)"
Now, when you say "vintage 2WD buggy" you automatically get to the RC10 sooner or later. With it having played an important role in RC history, as well as having a distinctive look with it's gold anodized metal tub chassis, this fame is well deserved. Looking at some nice re-release builds, the RC10 also captivated my attention, and I started looking for an affordable one, but still in good enough condition for a rebuild. I ended up with a fairly complete one, and another with some spares, hoping to be able to make at least one fully complete car from those, and hopefully also with the era-correct parts. The latter goal is not so easy, as I've learnt that sometimes kits were assemble with whatever parts were at hand at Associated. We'll see how far I can get with this "RC puzzle". Pictures for Build Log - "Corally Optima Mid"
For a while now I have been restoring vintage RC cars, and I enjoy that more and more. However, there are a few things that you need to be aware of, when considering starting such a project. Not that I consider myself an expert, but still maybe my personal experience can help others in this area. Unless you happen to have nearly unlimited funding, and can afford a NiB (New in Box) car, or happen to stumble upon a cheap one in a small model shop in a back alley, a restoration process often starts with the purchase of a used car. Since this is going to be the base material for your project, take your time to verify what condition it is in. Especially if you buy online, like me. Look at the pictures closely, if needed ask for more pictures, download the car's manual, and see if parts are missing, or are substituted. At this stage it's also smart to think about what you want to do with the car. Have it sitting pretty on a shelf, make it a runner, perhaps even run in a vintage competition? It determines if you need additional parts, for instance, a shelf queen doesn't need soft tyres, as long as these still look ok, it will be fine. But if you want to compete, running on dried out tyres is not such a good idea. Pictures for Build Log - Project "Optima Mid Custom ZX-R"
As the title suggests, here is where I will upload the pictures I will use for a recently started build log, where a vintage Kyosho Optima Mid Custom will be restored and converted to use some parts of it's successor in time, the Lazer ZX-R/ZX Sport, creating a "hybrid" buggy which hopefully will have the best features of both vehicles combined into one. 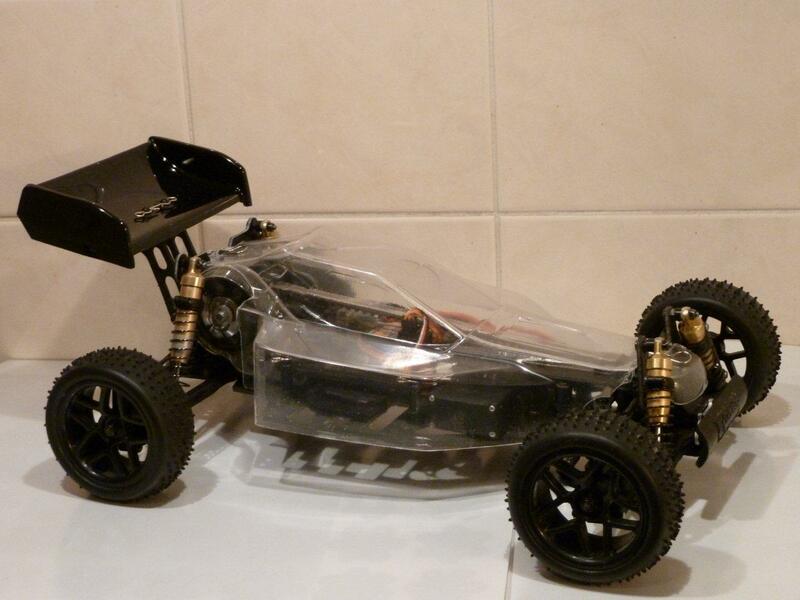 As the title suggests, here is where I will upload the pictures I will use for a soon to be started build log, where a battered Kyosho Optima Mid, purchased for spares only aka parts donor car, is transformed into a fully functional race car again. Vintage Kyosho Buggies, why I love 'em so much! Since this blog is still empty, I decided to change this. A little background information about the guy you know as SoloProFan might seem convenient, right? First, some may know me as simply "SoloPro" which is the name I registered with on RCG, by many abbreviated as simply "SP". But as my stay here was longer than I first anticipated (I registered in the first place just to get some info about how to fix and fly the new Solo Pro V heli I had bought during year) things started to become a little confusing. When someone typed a message, talking about SoloPro, one moment he could be talking about the heli, and have accidentally left out the space between the words Solo, and Pro, but it could also be about me. So I found having a name that was the same as a popular type of heli, could be confusing, hence the name change with the "Fan" bit added. No more mixing up things, and there is also a little pun intended, as a heli's blades do resemble a fan.